Home » Specials » Herbal Viagra? Probably the best thing Lamar Odom has done since giving the Lakers a couple decent seasons as a backup forward is bringing to light the dangers of taking unreliable herbal supplements. Let’s be clear: Mixing cocaine and sketchy herbal supplements, like former NBA player Odom reportedly did recently, is never a good idea. Sources claimed Odom used several doses of a so-called “male enhancement” herbal tonic before collapsing in a Nevada brothel. And while there undoubtedly are some supplements that are beneficial and effective, it’s unlikely that they will be found at the counter of your local gas station or bordello. There are two diametrically opposed medical systems at work in America and the rest of the Western world. One can be called “holistic” and is often referred to as “alternative medicine” or “alternative therapies.” The other is allopathic or conventional medicine, the kind government subsidizes, that uses primarily drugs, surgery and technology. Holistic medicine generally recognizes that the body works as a whole organism and treating one complaint in an isolated fashion is counter to how the body is designed. Holistic therapy typically looks at the whole (surprise!) and never ignores how seemingly disparate functions and modes are actually working in coherence with the rest of the body. Every experience, thought, action and behavior has impact on health. By strengthening the whole being, energetically and physically, a healthful balance is restored and disease is eliminated. Whaddya mean, “alternative”? Somewhere along the line, sometime in the 20th century, therapies that have existed for thousands of years became known as “alternative.” It is ironic that allopathic medicine featuring pharmaceutical drugs, surgery and technology, in existence for only about 125 years, has somehow become known as “traditional medicine.” Meanwhile, time-tested remedies like Traditional Chinese medicine, acupuncture, ayurveda, true herbal medicine, and other holistic modalities effective for thousands of years, were relegated to a genre that seemed second-string and viewed with a skeptical eye. But with a ‘60s generation that spouted, “Question Authority,” and celebrated comics such as “Mr. Natural”, we saw increased interest in holistic approaches to health. Marry that to journalist James Reston’s account in the New York Times of his positive experience with traditional Chinese medicine while undergoing an emergency appendectomy while reporting on Nixon’s China junket in 1972. Then factor in Linus Pauling’s groundbreaking 1970 best-seller Vitamin C and the Common Cold and we see a huge upsurge of interest in herbs, nutrition and vitamins as a means to restoring and maintaining health. Clouding the perception came a glut of not-so-natural supplements. Unlike herbs, one would be hard-pressed to find these chemical and extract supplement forms in nature. They have flooded the shelves of drugstores, convenience stores and gyms. These types of supplements with the weird names and formulaic descriptions benefit from the halo effect of holistic, traditional therapies but in most cases suffer Western medicine’s same mistake of being reductionist and derivative in the approach to healing and health. Such is the case with the type of supplement touted as “herbal Viagra.” It’s wrong on so many levels. First, it’s likely most Viagra-like drugs aren’t really used to treat an ailment but as a “performance enhancing drug” — sorta like what gets athletes banned. Secondly, these kinds of supplements haven’t passed the most important evaluation that a real traditional, holistic therapy must: the test of time. When worlds collide. The most trustworthy holistic therapies — often labeled “alternative” — are the ones that time has shown to work. Acupuncture works. Meditation works. Massage therapy works. Ayurveda works. Bona fide herbal therapies work. A host of other, adjuvant therapies are also effective. One can’t rely on modern Western medicine to validate those kinds of therapies because Western allopathic medicine doesn’t understand them in the first place. E.g., the Western medical paradigm trying to understand acupuncture is like a dog staring at a stopwatch. Simply put, I guess I use three main factors in choosing a healing modality: Is it attached to a long-standing cultural system such as Chinese medicine, ayurveda, folk medicine or Native American? Has it stood the test of time? And, does it pass the common sense test? 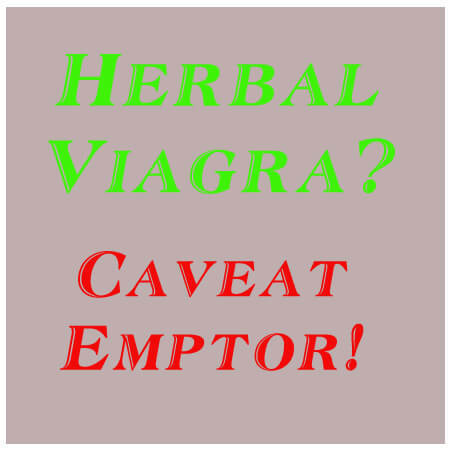 And, as in the case of the so-called “herbal Viagra”, how could one not practice caveat emptor for something as dubious as that? Just because something is not conventional medicine doesn’t make it a viable alternative. And don’t let the words “herbal”, “natural” or even “holistic” sell you a bill of goods that could put you on life support.